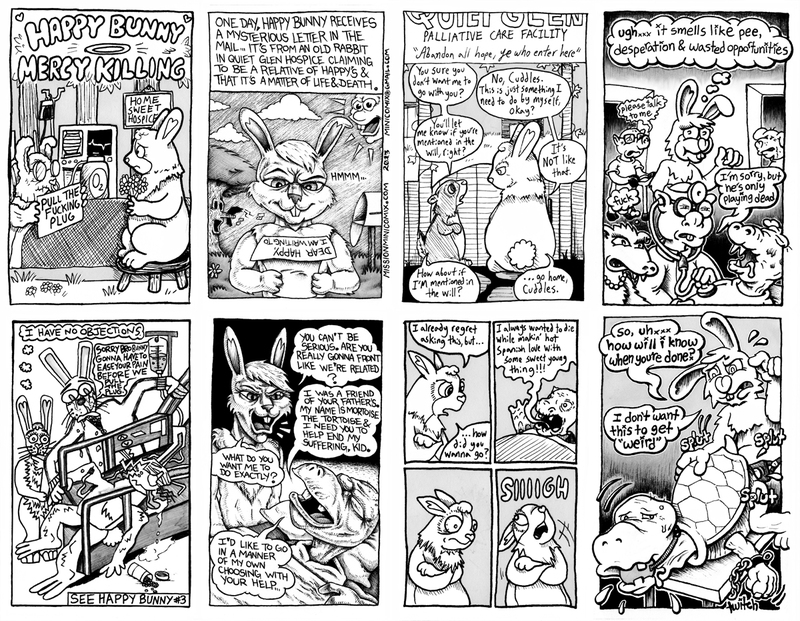 This is the 4th comic in the Happy Bunny series, which has become a beloved character for the MMC Crew due to the delightful dichotomy between his/her cutesy pie outward appearance and the more raw underground nature of the series’ subject matter (as well as his/her perpetually ambiguous gender). Compared to going to the Abortion Clinic or getting STDS, this latest adventure for Happy Bunny looked like it might be relatively tame. But, although the path was dark and full of errors, I believe we threaded the needle on taking this to a whole new level of inappropriateness. Shown here is an example of where the comic almost went. It’s not often we scrap panels in the middle of “development” (so to speak), but halfway through a panel I felt “okay” about I had the idea of the final panel and convinced Mikey and Audrey to use the last two panels before that to set up the “gag”. There was nothing wrong with the panel that got discarded, but that was kind of the problem. We set a pretty high bar with how wrong the happy bunny books were, and this panel just wasn’t going to set up an ending that was wrong enough. This comic also features the 2nd appearance of the bro-bunnies, and the 3rd of Cuddles the Chipmunk. Also pretty interesting here is the fact that the artist contributions seems to follow columns… Audrey and Justin shared the first column, second column was Mikey’s illos, Audrey drew both panels in the third column, and I did both in the 4th. Weird.